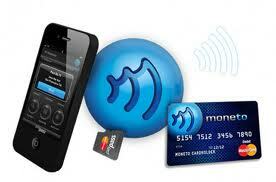 DeviceFidelity and SpringCard have unveiled moneto, a multiplatform mobile wallet solution for iPhone and Android users. Much like DeviceFidelity’s In2Pay solution, moneto relies on a protective iPhone case equipped with an NFC-enabled microSD card. The moneto mobile wallet is powered by MasterCard PayPass technology and linked to a reloadable MasterCard prepaid card to enable contactless mobile purchases wherever PayPass is accepted. To use the service, iPhone owners can sign up at moneto.me to receive the case, install the moneto app from the app store, and activate their account. The app enables users to view their account balance, check transaction history and make everyday in-store purchases with a tap of their iPhone. The solution also comes with a moneto branded prepaid MasterCard to give users the ability to access cash at ATMs and make online purchases, pay bills or shop at merchants that do not accept contactless payments. According to DeviceFidelity, the first Android handsets compatible with moneto are expected to arrive by Q2 2012, with more added throughout the year.